Craig, Fla., later renamed as Craig Key, was once known as Camp Panama according to the Miami Daily News. In the January 28, 1931 edition it featured a short article titled “Camp Panama Offers Excellent Angling. . . . Located 90 miles below Miami, about two miles below the ferry landing on the lower Matecumbe, Camp Panama is right in the very best key fishing grounds. . . .” The newspaper article concluded “. . . For the convenience of visitors to Miami the camp maintains an office at 409 City National Building in charge of R. W. Craig.” From this article we cannot conclude that R. W. Craig owned Camp Panama, but at the least he was associated with it. There was an accompanying advertisement stating, "Rates $12.50 to $15:00 per day, which includes transportation from Miami and return, meals, lodging, boat, all fishing tackle and guide. By Reservation Only. Phone Miami 3-1404." Since at that time there was not a highway to Craig, boat transportation would take too long for daily rates, I conclude that at a minimum a railroad "flag stop" was established. I do not have copies of all the FEC railway time tables, but in my December 1932 time table a regular stop had been established at Craig, and probably earlier since a post office was established in October 1932. The original Craig was not the two small islands on the bayside that are there now at about MM 74. These two islands came along later when more space was needed. The island to the southwest (south) was dredged and filled in about 1955 by local contractor, Alonzo Cothron. The other island to the northeast (north) was made by Floyd Lambert of Marathon some time later. 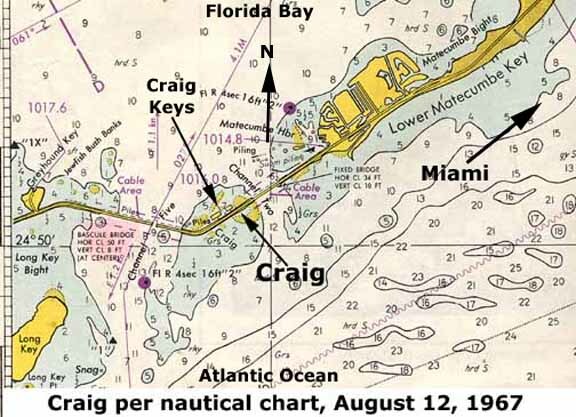 The original "Craig Key" was a wide place on the railroad right-of-way which after the 1935 Hurricane became the Overseas Highway; therefore, was like the other two islands, a man-made Key filled by Henry Flagler. It was surrounded by water on the east by Channel 2 and the Atlantic Ocean and on the west by Channel 5 and Florida Bay. 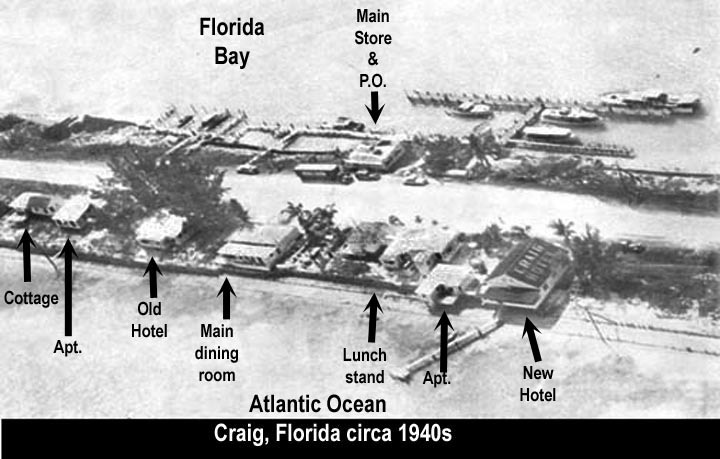 Craig's cottages, hotels and restaurants were on the ocean side and the store-post office, gas station and docks were on the bayside. Deep water access was by way of the Channel Five Bridge and a channel through the flats to/from the bay. Therefore, the early history of Craig began in the early 1900s with the construction of the railroad and Roland Craig gave it the name when he leased it from the FEC Railway in the early 1930s. For the reason that this strip of filled right-of-way was wide enough for the community of Craig to develop, we need to review a brief part of railroad construction history. This is the part of the Key West Extension construction normally forgotten in most articles. 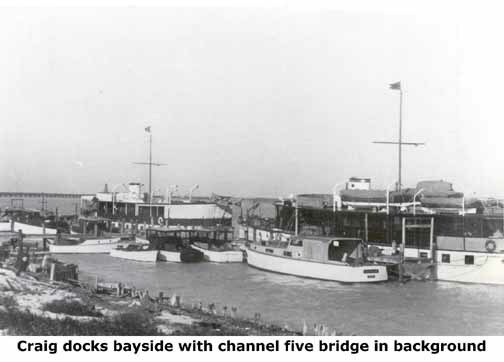 Most assume once Flagler rode to Key West on December 22, 1912 all construction was completed. In fact there were four additional years of construction to be done. To begin with, the open water to be crossed from Lower Matecumbe Key to Long Key was 4.83 miles - the second longest water expanse to the crossed enroute to Key West. The difference between this expanse of water and the 7-Mile Bridge area was this expanse was much shallower, meaning that it could be filled. However, one portion was much too deep to be filled (Channel 5) and the other (Channel 2) was deemed necessary to be left open to exchange tidal waters between the ocean and the bay. One would think that there would be channels 1, 3 and 4, but I know of no reason for this numbering. Much of the route that Flagler traveled in December 1912 was temporary construction meaning that after the opening ceremonies in Key West, William Krome and his construction crews had to return to the Upper Keys to build two more concrete viaduct bridges and one drawbridge without interrupting daily operation of the trains at this location. The original wooden trestles were not strong enough for daily operation of large locomotives pulling many cars. There were many other locations to be made permanent. Few realize that for a while there were two parallel sets of tracks between most of the lower Lower Matecumbe and upper Long Key span area, that the two tracks were merged and the original wooden trestles removed. Work continued throughout the FEC Key West Extension until 1916 before it was totally completed; therefore, it is incorrect to say that the railroad was built in seven years (1905 -1912) - 11 years is correct..
To facilitate the construction crews and support areas, the elbow shaped area now known as Craig Key was at least double the width of the typical bridge filled approaches. At the very northern area of this elbow was also a railroad siding which meant triple land width at that site. This was known as "Cook's Siding." For years there was a highway traffic pull off on the ocean side at this area. Not many details are available for the 1913 to 1916 construction period other than a few construction summaries. It appears that once rail service began in 1912 even though it was over temporary tracks, the pressure was off, perhaps totally lost, for media coverage. A huge problem was that scheduled train traffic could not be interfered with or dangerous construction efforts undertaken. The existing construction equipment was built to use in open water and not confined areas such as very near the operational wooden trestles. One advantage was support could be given from either end, the southern Lower Matecumbe site named "Crevasse" or the northern Long Key site named "Rossmore." The construction reports indicate that considerable fill was added, but we can only assume that it was widened to accommodate the construction facilities as well as the permanent set of bridges/tracks along side of the operational set. It is during this period that I feel a sufficiently wide area was built and buildings left for a small fishing operation. The date is not known, but some time around 1930 or 1931, Capt. Craig leased the right-of-way from the railroad. After the 1935 hurricane and the remains of the railway system converted to a highway 1937, the State Road Department (SRD) honored the previous lease. Not much is known of this period, but SRD may have repaired some of the facilities to use during the highway building process. A view of the facilities at Craig Key is shown below. Going back in time, Captain Buck Starck remarked that in his early days (1920s and 1930s) of chartering fishing excursions out of the Royal Palm dock in Miami, Craig was the "Center of the universe for Miami charter captains." Captain Starck and others used large 100-foot boats towing their smaller fishing skiffs, and needed six to eight feet of water to dock for supplies. The only places to dock in the Upper Keys were the Angler's Club, Long Key Fishing Camp and Craig. The first two catered primarily to their own members, but Craig had his share of customers from the regular fishermen, celebrities, industrialists and even presidents. The Miami Herald in an article about fish as large as whales on February 20, 1949 stated, " ... Actually, the only camp we know of to boast a regulation whale is R.W. Craig's in the Keys. Poor Ole Craig after years of prevarication', has come through with a 30-foot finback whale. "The Dude-F towed the mammal in for pix, then towed it offshore again before the odor exceeded its size. This operation gave Craig an exclusive privilege. "He is now the only known fishing camp proprietor in America who can claim - with complete honesty - that the fish taken at his place are as big as whales...."
Newspaper columnist, Water Winchell, paid tribute to Craig in his columns. Craig made Ripley's Believe It or Not twice. In 1938 Ripley depicted the small building on the left of the highway and telephone/telegraph poles and lines with the caption "Town Built on a Highway - instead of a Highway Built thru the Town." In 1947 he pictured a huge wave covering the boat with a man up the mast with and an arrow pointing to "Poor Old Craig." The 1935 census lists Craig with 21 residents. R. W. Craig was listed as manager/fishery and Mrs. (Dorothy) Craig as postmistress. The Craig's had twin daughters, Sally and Suzanne, one and a half years of age on the census. Craig was affectionately known as "Poor Old Craig." Stories abound of how he obtained this nickname. His business and his popularity grew and he even dabbled a little in politics. Craig defeated T. Jenkins Curry, the first county commissioner from the Upper Keys, and served in the position from 1938 to 1942. He was defeated by Harry Harris. 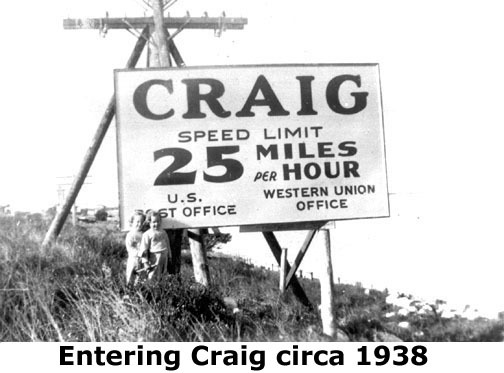 Postal records show the post office at Craig, Florida was established on October 19, 1932, discontinued on August 31, 1944 and re-established on April 1, 1946. In August 1954, Postmaster Craig announced that his post office would be open 365 days a year, including Sundays and holidays. Local newspapers stated they knew of no other "year around Post Office." Recent rebuilding (2009) of the Overseas Highway by the Florida Department of Transportation removed all remaining traces of Craig, Florida other than the two islands. For those who knew, a Florida almond tree was there. The Craig children told me how their mother, Dorothy Craig, planted the tree and watered it daily with the dishwater thrown out with each meal. If there is something in your life that should be preserved, do it today - at least take the first step. Time has no memory. To return to the Specific Locations and Keys homage, Click HERE.